Looking for unique field trip destinations and outreach programs for your students? Come check out the National Museum of Industrial History in Bethlehem, PA! The mission of the National Museum of Industrial History, in affiliation with the Smithsonian Institution, is to forge a connection between America’s industrial past and the innovations of today by educating the public and inspiring the visionaries of tomorrow. We strive to meet our mission statement by creating exhibitions and educational programing that tell the stories of the people, machines and ideas that are part of America’s industrial heritage. Located on the Historic Bethlehem Steel site, NMIH houses artifacts from the Smithsonian’s American History Industrial Machinery collection, the Bethlehem Steel Plant, the Lehigh Valley’s Silk Mills, and Pennsylvania’s Propane Industry. 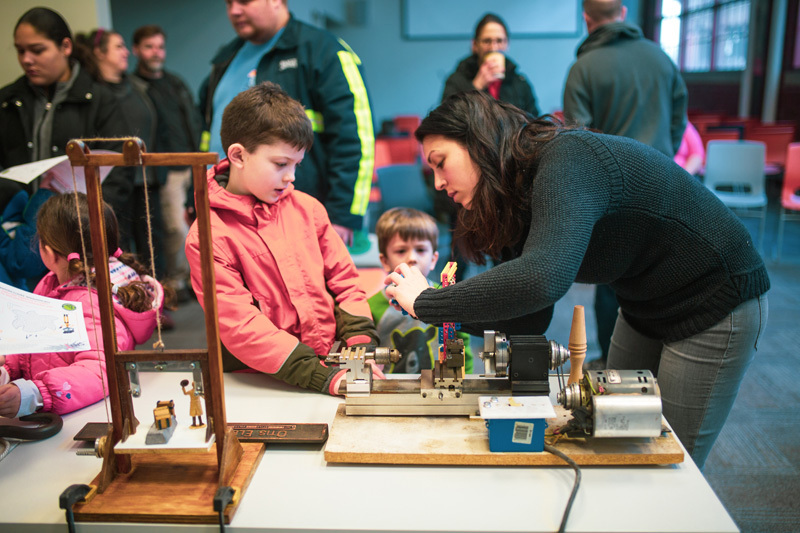 Interactive exhibits encourage learners of all ages to see how much horsepower they can produce, challenges them to lift as much pig iron as a Bethlehem Steel worker, invites them to learn how to use a loom to create intricate patterns, and introduces them to all the ways propane impacts their modern lives. School field trips are available for grades K-12. Students will participate in an informative and interactive guided tour of the Museum with experienced docents. We offer pre and post lessons that meet curriculum standards while providing educators the flexibility to adapt the content to fit their subject and student needs. For more info on booking a tour, please contact Kitsa Behringer at kbehringer@nmih.org. Your school may qualify for free or reduced costs for school field trips. Find out more here. 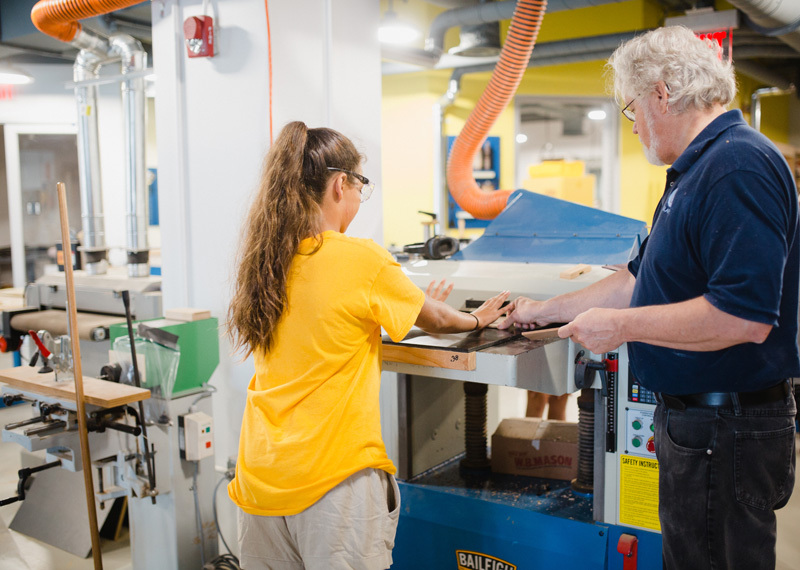 In the Centennial Gallery, see and touch a sample piece from each of our woodworking machines, files like those from the Nicholson File Company, and discover the difference between hand-made and mass produced nails. Learn how mechanization revolutionized industries making products more affordable for the consumer. In the Iron and Steel Gallery, visitors have the opportunity to handle the local natural resources that are the foundation of Pennsylvania’s industrial heritage. Follow these raw materials as they were historically combined to make wrought and cast iron products and then discover how the local iron industry became the nationally recognized Bethlehem Steel Corporation. In the Silk Gallery, we invite visitors to see the life cycle of the silk worm, touch silk worm cocoons, and feel silk in various stages of its production. Play a matching game between natural dyes, their plant source, and colorful silk threads. Learn about the invention of the power loom and try your hand at weaving a pattern. In the Propane Gallery, discover how propane is distilled, stored, and shipped while helping perform an experiment illustration Walter Snelling’s original experiment which identified propane as the volatile gas in liquid gasoline. Enhance your students’ visit to the National Museum of Industrial History with one of our add-on options. These educational programs offer your students the opportunity extend their experience in the galleries by engaging with the content in a deeper way and practice skills such as observation, evaluation, problem solving, and making connections. Students can connect with a different place and time through a discussion of what a factory is and what working conditions were like during the late 19th century. We consider what a factory might have sounded like as we create a soundscape and we recreate the setting as we play tableau. The study of time management impacts industry as well as our daily lives. How can we be more efficient and productive? Using several fun games, students are challenged to find the easiest way to be the most productive. Get into character and learn how the industrial Revolution in America impacted society. We discuss how lives were improved through advancements in agriculture and medicine, how family life changed, and what working conditions were like for typical professions. 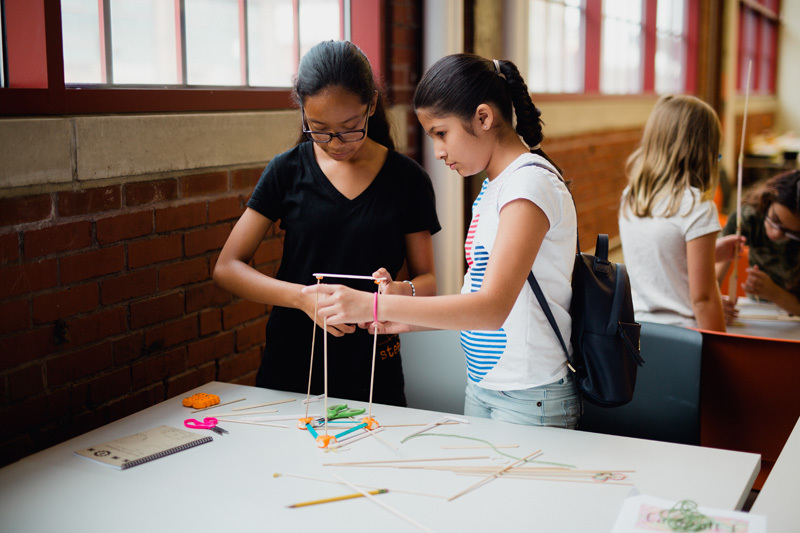 Grab Bag Inventing is an activity that allows participants to invent clever solutions while testing their creative abilities. Participants work together in small groups to design inventions with everyday items and common materials. How do magnets work? Why do motors run? What is a dynamo?! Learn the answers to these questions while taking part in hands-on activities. Each student will leave with a small motor they built!